Brown spots on skin, especially on the sunlight exposed skin areas such as face, are a nightmare for anyone. When exposed to UV rays, skin produces cells called melanocytes, which in turn produce the dark brown pigment called melanin. Melanin is responsible for skin turning darker in patches. 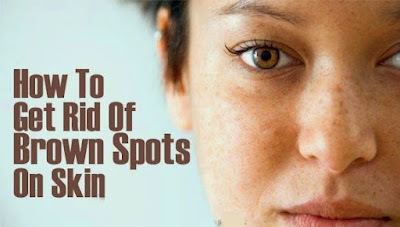 As these brown spots are mostly formed on face, they are commonly known as face spots. Aging people too experience brown spots and therefore these dark spots are also called as age spots. Certain home remedies can remove age spots as well as brown spots on face and give you a glowing skin. Apply lemon juice on the affected skin areas with brown spots to naturally bleach dark spots. Take 2 almonds blanch and grind them. Mix the ground almonds with the white of an egg and half teaspoon of lemon juice. Apply the mixture on face and leave it to dry. Wash off with warm water and then with cold water. It is good remedy to remove freckles and foe getting glowing skin. Grind 100 grams of dried basil herb leaves, neem leaves and mint leaves. Add some turmeric powder to the mixture. Mix rose water to make a paste and apply this to the face spots. Rub the juice of fresh garlic with cotton ball on face spots twice a day for six to eight weeks to move age spots on face. You can also rub slices of red onion on age spots. Rub fresh aloe vera get twice a day on the brown spots for at least a month or two months. Aloe vera is a miracle herb for getting a glowing skin along with other health benefits.